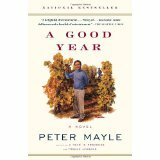 Peter Mayle’s A Good Year (Vintage Books, 2005; 0375705627) provides a blueprint for how to revive one’s existence. One merely needs to give up one’s old life, inherit a vinyard in France, and give one’s self over to the pleasures of food, drink, countryside, and good company while solving a minor mystery or two. Mayle’s characters revel in the charms that Provence has to offer, and we enjoy every moment right along with them. The protagonist, Max Skinner, leaves London when he inherits his uncle’s estate in France. His hopes of making a fortune from it seem dashed when he discovers that the grapes seem to have been specially bred to make people gag. His life becomes even more complicated when a putative cousin shows up and threatens to throw a wrench into his already crumbling plans. The apparently minor mystery of the vinyard’s inability to produce palatable wine leads to convoluted schemes and mercenary villains. There are clever counter-schemes and a satisfying resolution. A Good Year invites us all in for Provecal banquet, and it is an invitation worth accepting. This entry was posted in "I was reading …", Editing, Review and tagged A Good Year, France, mystery, Peter Mayle, Provence, Ruth Feiertag, wine. ← For Next Year: the Perfect Valentine’s Gift?